Senator Thom Tillis Collapses During Bike Race! Learn How You Can Be Proactive! 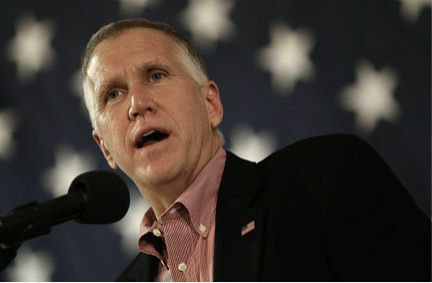 Yesterday, North Carolina Senator Thom Tillis collapsed during a three mile bike race in Washington, D.C. Tillis, who is 56-years-old, was taken away in an ambulance, and some reports say he needed CPR. Later in the day, Tillis released a video while he was in the hospital from his Twitter account, saying he is fine and he will “see you back on The Hill.” Tillis also said he got “overheated” two and a half miles into the race. For those of you who are marathon runners or fond of other forms of exercise that intensely challenges the body, you especially need to be proactive and diligent about giving your body what it needs, so you can avoid overheating and life-threatening conditions such as heat stroke. Of course, athletes need plenty of fluids to avoid dehydration, but you may not know about the critical minerals your body needs for energy and regulation not only in everyday life but especially when you are physically challenging yourself. Along with urinating, minerals are lost through sweating with exercise, so you really have to be proactive about making sure you have the appropriate fluid intake. Potassium. This mineral helps break down and use carbohydrates to fuel your body. It also helps control the electrical activity of the heart. You can see why it would be important to have sufficient potassium if you are exerting yourself physically. Potassium can also help with muscle cramps. Sodium (Na). Sodium and potassium are the main “electrolytes” doctors tell you to take while running. A marathon runner can have low sodium if he or she guzzles pure water while sweating out salt over the course of many hours. That’s why endurance athletes sometimes need IV fluids after a big race -- it’s the same treatment people get in a hospital. IV fluids contain sodium with water. It’s tricky, because you want to prevent dehydration by drinking plenty of water, but you also do not want to deplete all of the sodium in your body. According to National Institutes of Health (NIH), for intense prolonged exercise lasting longer than one hour, athletes should drink between 600 and 1200 mL/h of a solution containing sugar and sodium. Copper. Our bodies have little energy factories inside the cell, known as mitochondria, which create little energy packets known as ATP, from the food we eat. We need ATP for everything from getting up in the morning, to digesting food, to thinking and even pursuing a romantic partner. Without enough copper, mitochondria can’t make enough of the ATP you need. You can see why getting enough copper would be important when exercising. Dietary sources of copper include organ meats, shellfish, nuts, seeds, wheat-bran cereals and whole-grain products. Magnesium. We reported earlier that magnesium — an element and electrolyte that relaxes muscles in the body and supports proper cellular function — is missing in some sports drinks. Amongst professionals, the importance of magnesium is widely known. As early as 1992, scientists were sounding a call to action. Magnesium, they said, should be added to drinking water supplies, like fluoride. This is because statistics demonstrated a clear link between low magnesium and sudden death from cardiac arrest. Cardiologists already know that low magnesium (in combination with low potassium) may cause sudden cardiac arrest. Studies show that individuals with normal magnesium levels have a 38% reduced risk of going into cardiac arrest, and sudden death is more common in cities where magnesium deficiency is also common.This mineral is important for sugar breakdown and use, blood pressure regulation and muscle and nerve function, including the heart muscle, which, of course, is critical during exercise. Keep in mind, strenuous exercise may increase urinary and sweat losses that may increase magnesium requirements by 10-20%. Iron. This is a critical mineral every single cell in your body needs. It is needed to make hemoglobin, a component of your red blood cells that delivers oxygen to all the cells in your body. Without adequate iron, your body cannot carry enough oxygen to your vital organs. Without enough oxygen to your organs, the chances of feeling light-headed and collapsing are greater, especially during strenuous exercise. To learn more about the critical minerals that can help you as your conquer those marathons this summer, read Minerals - The Forgotten Nutrient: Your Secret Weapon for Getting and Staying Healthy.